The cold snap is virtually upon us and with it the road conditions change. 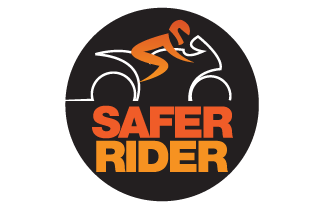 Many of you, some through no choice have to continue riding in cold temperatures and poor surfaces. Take it easy out there as it’s slippery and a lot of roads in the TVP area are not gritted overnight (usually unclassified/B roads etc). Keep on top of your bikes maintenance and ensure your tyres are in good condition. Keeping warm is vital, if you’re cold you’ll start concentrating on your temperature rather than your ride and in these conditions you need to be on top of your game in the riding stakes. Keeping your main core warm is the priority. So many people spend more time on extra thick gloves and socks etc that they ignore the torso, keep the torso wrapped up really well and your extremeties will stay warmer for longer. If the torso cools, the heart will start drawing warm blood back from your fingers and feet to preserve the cores temperature. So keep your body toastie and the rest will stay warmer for longer! Another rider spotted approaching a junction with a very bright and low sun behind him, this shielded him from the view of the driver ahead who was waiting to turn right. The driver moved but saw him and stopped, the new rider panicked and grabbed a handful of front brake and he did well to keep it upright for a couple of metres but it eventually went from underneath him. No real damage other than a bit of pride but it all could have been avoided though by riding at an appropriate speed and allowing the right time and distance to stop safely, upright, in time and on his side of the road. ‘Time to react’ is a foundation of Roadcraft, apply this is most situations and you won’t go far wrong!